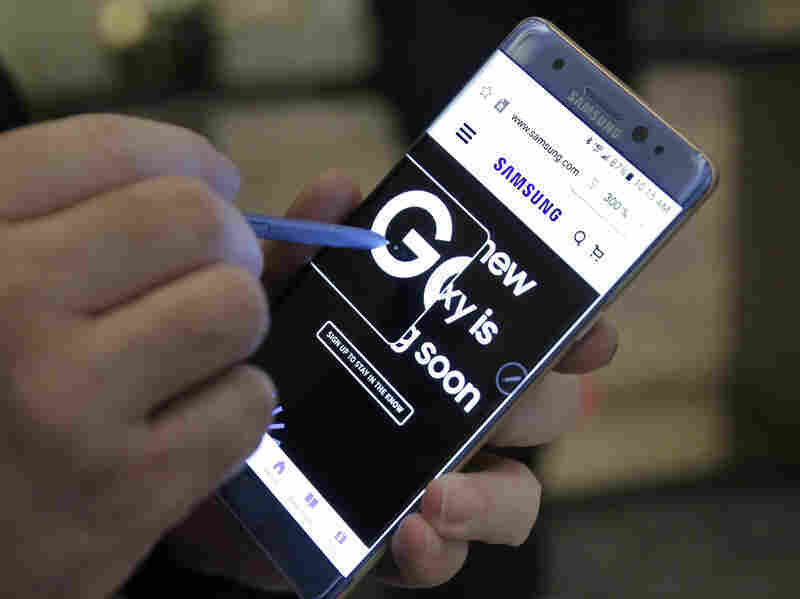 Samsung Permanently Powers Down Galaxy Note 7 Smartphones : The Two-Way Last month the tech giant recalled 2.5 million phones after some were catching fire or exploding. After reports that the replacements are dangerous, too, the company is permanently ceasing production. Samsung says it is discontinuing production of the Samsung Galaxy Note 7 after reports that its batteries overheat and catch fire. The U.S. government recommends powering down and not using the device even if it is a replacement phone. Samsung Electronics is permanently ending production of its flagship Galaxy Note 7 smartphone, after trying for more than a month to solve the problem of the device catching fire. Samsung, the global leader in smartphone production, announced Monday that it is suspending sales of the smartphone after reports that some replacement devices were also spontaneously igniting. On Tuesday, Samsung announced that it is halting production, and a spokesman told NPR's Elise Hu that production will not resume. "This is the end" of the phone model, Elise says. The news comes after Samsung announced last month that it would recall 2.5 million Galaxy Note 7 smartphones amid reports that batteries were overheating and were a safety risk. The company reportedly changed battery suppliers, but that doesn't appear to have solved the problem. Last week, a Samsung Note 7 began smoking on a Southwest Airlines flight, prompting an evacuation of the plane. The phone was reported by the owner to be a replacement phone. The four top U.S. telecom companies — Verizon, AT&T, T-Mobile and Sprint — have announced that they will no longer sell the replacement version of the Note 7. All four are offering to replace existing Note 7 phones. Australia's top three telecoms — Telstra, Optus and Vodafone Australia — also announced that they would no longer ship the Note 7. The U.S. Consumer Product Safety Commission issued a statement advising "all consumers who own a Samsung Galaxy Note 7 to power them down and stop charging or using the device." The Federal Aviation Administration warned travelers that even powered-down Note 7s should not be placed in checked baggage. Samsung spent weeks trying to address the issue, initially indicating that the halt in production would be temporary. The New York Times reported that the company had hoped to provide an update within a month. But within days, the company said the production halt was permanent, citing "customer safety." "The Note 7 was not made to be a big moneymaker. It's made to build the brand, justify Samsung's high price tags across products." Among technology publications and writers, the question now is, how much damage will the battery malfunction do to Samsung's reputation? "This is the worst-case scenario for Samsung. Now that the replacement devices seem to be having the same problems, it calls into question Samsung's whole product testing methodology and its scrutiny of its suppliers. That's much worse than a one-off." Others are comparing the Samsung's problems with another infamous product failure. "If the Note 7 is allowed to continue it could lead to the single greatest act of brand self-destruction in the history of modern technology. Samsung needs to take a giant write-down and cast the Note 7 to the engineering hall of shame next to the Ford Pinto."